That may be true. I give a lot of credit to intention. Before we wave our hands in the air like we just don’t care… I also give a lot of credence to the Buddhist saying about the finger pointing to the moon, which is about looking beyond the finger to find the truth. Sometimes the truth is that the printer intends to do the right thing for the environment by using water-based inks. They are moving in the right direction by being conscious about their screen printing practices. That’s very mindful of them and I applaud it. But to be truly “earth-friendly,” we need to look deeper and understand what’s behind the curtain of water. People sometimes assume that because it’s water-based, it’s automatically earth-friendly. It definitely sounds friendly, like we could drink a tall, cold glass of screen printing ink and not die. Or, we could just wash it all down the sink with the moldy salsa. The problem is that water-based ink is not just water. There are pigments, binders, thickeners, and sometimes, even co-solvents in the ink residue (source:Ryonet). So even though it sounds enviro-friendly, water-based ink can still be toxic and not good for municipal sewage systems – or the oceans and rivers where the water eventually winds up. If the ink itself weren’t enough, we have to consider how the screens are cleaned. Water-based inks can be cleaned with water… unless they dry out. Then we need to use much stronger solvents. While they do make solvents that are more enviro-happy, we can’t assume every shop who says they use water-based ink is using them. Or that they’re following other earth-happy shop practices. 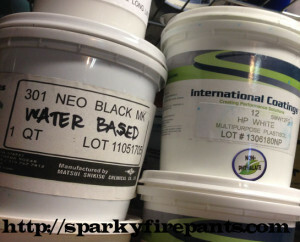 In our shop, we use plastisol inks for most of our printing. They are PVC-based, Phthalide-free inks that when cured with heat turn to a solid. We clean our screens with a soy-based cleaner and cotton rags. The cleaner reacts with the ink, rendering it biodegradable and drain-safe (can be filtered in our system). The cotton rags are heat cured, making the plastisol a solid, which can be disposed of – except that we reuse our rags. Is that better than water-based? It’s not a death match between water-based and plastisol. There are good reasons for using both, depending on the situation. For example, we need to print on spandex with plastisol ink (it’s stretchy). We print posters with water-based ink (you can’t heat cure paper). Good shops are never perfect, but they are open about their methods (truth) and always improving (intention). Those shops that tout their use of water-based inks should be just as knowledgable and open about their ink’s content and cleaning methods. Do you care? Then do this! What type of ink do you use? Can you point me to the manufacturer’s web site? What solvents do you use to clean your screens? Where does the water go when you clean screens? Is it municipal drainage or you have a different disposal solution? What are the right answers? They’re the answers that make you feel comfortable about getting your printing done. It’s that simple. But I will say that if a printer refuses to answer them, you should keep looking. If this sounds like a lot of work just to get some frikkin’ t-shirts printed, you’re right. If you care, you care. If not, you probably stopped paying attention a few paragraphs ago. The point is, you can never assume that something is environmentally friendly by reading an advertisement. Do a little homework. If you really do care about the environment, it won’t hurt a bit. ← A challenging print run… and Sparky sticks the landing! Hi, I would like to know do you have soy based printing ink so? Is that even more eco friendly than water-based ink then? Hi, we are in the process of testing soy-based inks, which could be really exciting for us and our clients. They are supposedly the most-eco-friendly screen printing inks you can get. When we finish our tests, I’ll post the results on the blog and in our emails.